The clicker is a small plastic device with a metal strip that makes a specific sound when it's pressed. This sound is very distinct from your voice and other sounds that your cat hears every day, and that's exactly what you need to get your cat to respond to the signal. A click can therefore be associated with a particular behaviour. Treats given to your cat right after a click reinforce the desired behaviour. Have you ever noticed that your cat shows up in the kitchen out of nowhere as soon as you're about to open the can with its favourite food? That happens because your cat has learned a signal (can opener sound) that corresponds to something it likes (food), and your cat is rewarded for coming (eating). Clicker training works in the very same way. It can be used to teach the cat many things like performing tricks, accepting a crate, a leash, rides in the car, and so on. How do I clicker train my cat? The step number one is to associate the click sound with some reward, a treat or a toy. Your cat should learn that the click sound means something wonderful is about to follow. Take a bowl full of your cat's favourite treats and sit beside your pet. Press the click and give your kitty a treat right after, within a second or two at max. Repeat this several times until your cat is no longer interested in what's going on. Repeat the whole process again in a few hours. Be patient. Some cats will learn the click-treat idea almost immediately, while others may need more time. This process is sometimes called "charging the clicker" or "loading the clicker". As soon as your cat understands the click-treat idea, start looking out for the behaviour you want to encourage. For example, if you want to train your cat to sit, watch your companion for a while until it does what you're waiting for. Click as soon as the desired action is performed, and hand a treat. Be sure to click at the exact moment the cat sits because timing is crucial. After you've done this several times, your cat will most probably get the idea. Don't forget to reward your kitty every time it performs the desired action upon a click. • You don't necessarily have to buy a clicker. You can use any distinct and unique sound, for example the "snick" sound of a ballpoint pen or a tongue-click. • Keep your training sessions short. Cats won't want to focus on the training process for as long as dogs. Several short training sessions are going to be much more fruitful. • It's always better to start with something easy, something that your cat would most probably do on its own (sit, come, touch your hand with his paw, etc). • Don't force your cat to perform the desired behaviour. His or her movements should always be voluntary. • Focus on positive reinforcement. For example, instead of punishing your kitty for scratching on the furniture, reward him or her for using the designated scratching post. 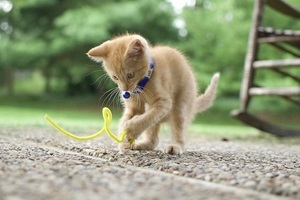 • Clicker training can be started when the kitten is as young as 8 weeks of age.